It feels peculiar to be writing about this novel now, so this may be a slightly peculiar post. I am, as you probably know, a fan of Adam Roberts’ work; have been since his first novel. It can be hard work trying to convince others of his fiction’s appeal, hard work that I seem to undertake quite often. But I don’t admire all his books equally, of course, and, having had a period of, for one reason or another, reading two or three Roberts novels a year, about thirteen months ago and with no basis other than the blurb, I arrogantly decided that Yellow Blue Tibia sounded like relatively minor Roberts, and that I could afford to skip it to spend more time with other authors. I could catch up when it came out in paperback, maybe. This seemed a reasonable decision, for a while; the reviews I commissioned for Strange Horizons were lukewarm, for instance. (Although in retrospect the fact that Liz liked it should perhaps have clued me in.) Then, of course, came the summer, and Kim Stanley Robinson sticking his oar in, and suddenly everyone was talking about the book — it even made it to Newsnight Review. Come the end of the year, and it’s popping up on top ten lists, and people like Jonathan are saying things like “it is genuinely astounding” and “a real milestone not only for him as an author but for British genre writing in general”. Suddenly Yellow Blue Tibia is a book I need to read if I want to pretend to be informed about what happened in sf in 2009; and suddenly I’m in the odd position of coming to a Roberts novel with an external weight of positive opinion behind it; and in the perhaps more curious position of, having read it, thinking that yes, it’s good, but it’s not (for me) in the first rank of Roberts’ work. Adding to the slightly odd feeling is my reaction to the narrator. 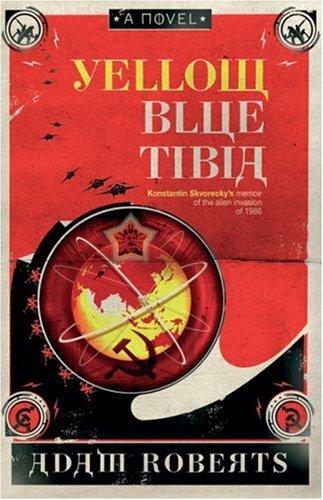 Yellow Blue Tibia is framed as the autobiography (well, autobiography plus promotional pamphlet) of Konstantin Svorecky, a Russian science fiction writer who, in the 1940s, is along with other Russian sf writers recruited by Adrian Veidt Stalin to write an alien invasion narrative that can be used to give the Soviet populace an enemy to unite against; and who, forty years later, starts to encounter evidence that the story he worked on might be coming true. Roberts confesses to the same habit, and I’ve seen more reviews than I can count accusing his work of lacking heart. (For example, since I have it to hand, the review of Yellow Blue Tibia by Stephen Deas that will appear in the next Vector: “I have this idea that stories engage with readers … on an emotional level and … on an intellectual level … Yellow Blue Tibia is firmly entrenched at the latter end of the spectrum … Readers after an emotional connection may find it difficult to engage with the story.”) Svorecky’s voice, I would say, sounds closer to Roberts’ reviewing voice than any other narrator Roberts has written precisely because of its constant self-awareness. (And I would nearly swear, too, that Svorecky mentions translating the work of Robert Browning [on whom Roberts did his PhD] at some point; but I didn’t note the page, and can’t find it, so may be misremembering that.) Anyway, my reaction to this narrator is odd because I know Adam Roberts a little; enough, in fact, that in this venue calling him “Adam Roberts” or “Roberts”, feels disingenuous. Because I know he’s probably reading this, and I know that the rest of you know he’s probably reading this, and because I was exchanging emails about reviewing with him on the evening when I was finishing his novel. More importantly, though: so what? Well, it’s probably obvious by this point that Yellow Blue Tibia is among other things a novel about science fiction; to be specific I’d say it’s a novel about a science-fictional way of seeing, about the way of seeing that sf creates. Svorecky deploys sf metaphors throughout: a character is described as having “triffid-thick legs” (142), water in the spent fuel pools in a nuclear reactor is “like the water that might fill the lakes of a distant planet in a science fiction magazine’s cover illustration” (185), and so forth. At various points the novel touches on how sf mis-represents the world: its tendency to genocide, for instance, the boys-own air it can give off. Important characters are scientologists, and the contradiction of UFOlogy – that millions believe they have experienced them; that they obviously cannot exist – is central to the novel. I feel rather guilty about enjoying sf novels that are so explicitly about sf – despite the fact that I enjoy digging out the ways in which any sf novel is about sf, the ways in which it argues – but if anything mitigates that in Yellow Blue Tibia it’s the fact that it’s about the broad cultural manifestations of sf, not (or only to a relatively small extent) about its narrow genre manifestations. So it makes perfect sense that its answer to the UFO question, its key science fiction conceit, quite brilliantly forces the narrative to contort itself according to the conventions of a big-budget sf action film — the narrative conveniences (a bomb is found almost as soon as Svorecky starts searching for it) and improbabilities (Svorecky survives fights and injuries that he really should be killed by) — and the absurdist conventions of Soviet speculative fiction such as The Master and Margarita. And, to be even more specific, because the narrator strikes me as being so Adam-ish, I can’t help but read the novel as to some extent a working-out of Adam’s ideas about what sf is and does: “built around the eloquence of the image, often oblique, fascinated with transcendence … and at its best actively corrosive of reality … a sense that the pre-eminence of SF’s ‘epiphanies’ … also entails a pre-eminence of laughter.” All that is in there, arising out of the contradictory understandings of the world that Yellow Blue Tibia holds in tension. This is not a backlash. Yellow Blue Tibia is a good novel. It is funny, involving, intellectually crunchy, and has a Robot Stalin. I do tend to agree with Mike that the narrative is somewhat uneven; the middle does feel baggy, several of the comedic sequences do outstay their welcome just a little. That said, I disagree with Mike’s assessment that the final chapter is rushed; indeed it mostly made me feel rather smug for having figured out what was going on about half-way through the book, and I think Dan demonstrates quite well how thoroughly coherent the book is on the level of argument. (Other reviews: Clute, Cheryl Morgan, Adrienne Martini, Rich Puchalsky, Abigail, David, Scott Eric Kaufman.) Yet as Adam’s books go I prefer, in particular, The Snow, Gradisil, Splinter or Swiftly. This surely has as much to do with me as a reader as Adam as a writer. I think I like those books in particular because they are the ones that feel most open to me: a little ragged around the edges; they have more for me to poke at, more jags to irritate my mind. The very coherency of Yellow Blue Tibia is a little off-putting, particularly when it also produces a romantic resolution much more conventional, more emotionally transparent, than is usual in Adam’s books. I know that’s a consequence of form, a convention of the narratives Yellow Blue Tibia is playing with; and yet at the same time, because of how I have come to the book, because of how I know its author, it feels almost like a concession. Those are the contradictory positions Yellow Blue Tibia leaves me to reconcile. This sounds like something I must read. I’ve liked Roberts’s work since reading a novella in, hmm, Spectrum SF I think, but I’ve only picked up a few of his novels (Up and Snow) and while I liked them a lot, they were more interesting than resonant. This is by far the nicest negative review I’ve ever received. …I might add, in case that just looks dismissive: it also seems to me pretty-much spot-on about the novel; insightful and very well expressed. I think that Mike’s views on the pacing are wrong-headed. Yes, the middle act is quite slow compared to the opening act and in contrast this makes the third act feel like one head-long rush but I think that that’s not so much bagginess as deliberate pace changes allowing you some intellectual breathing room before the final onrush of understanding. I can also understand why one might feel slightly awkward about both of these characteristics as it might feel a little ‘on the nose’ as it makes the novel feel a bit like a fictionalised SF essay but I didn’t feel at all awkward. In fact, I quite liked that I got all the in-jokes. In a way, the bone of contention between us might be the question of whether art should be in-ward or out-ward looking. I don’t know. Certainly the changes in pace and tone are deliberate; I still feel that some of the scenes in the middle section overstayed their welcome. But then, farce is not my favourite kind of humour. I did like how the “onrush of understanding” was handled, though: Svorecky is the stand-in for the reader, there, as well as a writer, being made to suddenly see the whole elephant. the question of whether art should be in-ward or out-ward looking. I don’t know that it should be one or the other, and to the extent that the manifestations of sf that YBT engages with include the ones that affect millions of lives (as opposed to the ones that are read by thousands of devotees…), I admire it and think it well-done and, to an extent a thing worth doing. But for me, that’s the nub, I guess: only to an extent. And I’m not entirely sure why. It’s not like the novel doesn’t link its concerns to an outward-looking, real-world consequence, after all; I’m sure there’s much more going on with the communist elements of the book than I picked up on. I just took the communism stuff to be another instance of a big SFnal vision with real world consequences, much like scientology or UFOlogy. Oh, it absolutely is that, but more time is spent on it than either the scientology or the UFOlogy, when you think about it, and the guy with the PhD in depictions of Soviet science and technology 1940-1960 (Mike; dates may not be exact) seemed to think it mostly passed muster. Plus Liviu’s comment above. So I suspect it would yeild things to closer scrutiny than I can give it. I liked it overall, but would certainly call it lesser SF than the top novles of 2009, or for that matter Gradisil. It could be just that Roberts didn’t write the novel I most wanted to read after hearing of the premise, but I found elements in the satire under-developed and central analysis of a declining social-economic system (which we’re arguably now on the other end of) could have been evaluated a lot more heavily. Likewise, while the use of the novel to be about science fiction offered some provocative and counter-intuitive standpoints (science fiction as a form of communism as perhaps the best) overall the narrative seemed more interested in ticking boxes in its dramatization of the genre and toying with subversion than delivering a solid story. But then as I said, I suspect in part a victim of hearing of ‘Stalin comissions scifi that later starts actually happening’ and came up with different expectations that weren’t fulfilled by the work. In that regards my experience was the reverse of Niall’s, and it points up the danger of knowing a bit about the author and the plot premise of a given book. It makes one think zie knows what’s going to come, and subsequently punishing the author for being more versatile then expected. Unfortunately – for us or for Adam I’m not sure – I’m not going to call you wrong on this one. I think, as Jonathan says, we all agree on what the novel is, how it does what it does and even why it does it; what we disagree on is where all this leaves it on the qualitometer. I’m fairly relaxed with the idea that it’s impact on you is middling; certainly the first word I’d use to describe it is ‘fun’, whilst the first word I’d use to describe Swiftly might be ‘challenging’. To that extent we’re on the same page. I might say, though, that when you suggest the novel is “about the way of seeing that sf creates”, you may be revealing something of why the novel strikes you as smaller than it might be. For me, the book is about the way of seeing which sf – not only sf, but perhaps sf especially well – expresses. Yes, Yellow Blue Tibia is about Adam Roberts and how Adam Roberts writes sf; but it is also, I think, about why, where and how sf is written – that is, the genre is acted upon as well as acting. This, for me, makes the book richer and broader than you might be allowing. Ultimately, though, I prefer Tender Is The Night over The Great Gatsby for all the reasons you give for not caring for Yellow Blue Tibia as much as Gradisil. A book as complete as YBT can be impressive, but perhaps it can also a tad too forbidding. The novella I was thinking of was The Imperial Army in Spectrum SF #9 and I suspect my mind was playing tricks with regard to its length. And I would nearly swear, too, that Svorecky mentions translating the work of Robert Browning [on whom Roberts did his PhD] at some point; but I didn’t note the page, and can’t find it, so may be misremembering that. It’s pp. 67-68 of the Gollancz trade paperback. Ah, thanks! Good to know I wasn’t imagining things. Ok. Let’s call the writer character by his given name, i. e. Skvorecky. This name obviously doesn’t ring a bell for any of the previous commentateurs. Imho, it’s based on Josef Škvorecký, the Czech exile writer, living, writing (and teaching writing) in Canada. Check his work out, it’s worth it.